In my article about the Android version i promised to take a look at the DSLRDashBoard for Windows version. I must admit that i like the concept of DSLRDashBoard supporting a common handling and look and feel of a software on Android, Windows and iOS. 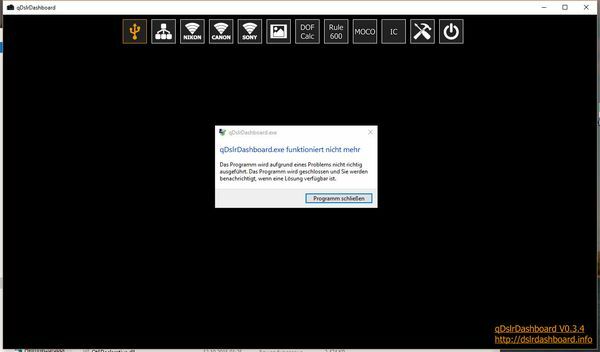 Therefore i tried out the Windows version of DSLRDashBoard. First of all you need to download and install the WinUSB drivers. I don’t understand why not using the built-in Windows drivers if the camera is recognized as soon as you connect the camera via USB. After installing the drivers you download the DSLRDashBoad 0.2.3 zip folder. Extract he archive anywhere you like. Within the archive you’ll find vcredit.exe, new runtime components for Visual C++ applications. I didn’t install this file first and occured error messages about missing DLL files when starting DSLRDashBoard. DSLRDashBoard itsself does not need any installation so you can start the application from within the extracted folder. Using DSLRDashBoard i recorded a little screencast, which you might want to view first. As you can see in the video and known from the Android version, DSLRDashBoard lacks stability. I tried the focus stack again since i noticed the error not saving the focus points while processing the video, just like the error not changing the ISO setting or aparture. But taking somewhere between 1-4 captures DSLRDashBoard freezes like you can see in the video. It is possible though that the problems occur on some camera modells, like my 7D and 5D MK II, since i know a couple of reports, where DSLRDashBoard is working fine. But according to my expereince DSLRDashBoard is not usable in for real productions. As i mentioned above the concept is right, but maybe it is too much to support 3 operating systems (iOS,Windows,Android) and different camera modells and different brands. I’m taking a further look to one of the next versions of DSLRDashBoard, but at the moment my advice is negative. What is your experience with this software and different camera modells. Just leave me your comments and questions of course. This is too bad, but DSLRDashboard still isn’t very stable, so i will not try it out any more. Selling the Android App for 9,47 € is pretty heavy too me, concerning the risk that the camera/smartphone combination wouldn’t work. Shortly after the christmas days there was a fix available for the failed version 0.3.4, which i installed right away. Now i was able to connect to the camera via USB. But on different situations (connecting, changeing f-stop or ISO) i got a bluescreen on Windows 10 with the error message kernel_security_check_failure. So too me this version is not usable. I am trying to do a school project and I am great difficulty in downloading dslrdashboard. I have a fairly old laptop 32 bit with windows 7. I have downloaded the windows drivers as requested, but I do not know how to fill it in to work., also I cannot find the right version of dashboard, I don’t know what I am doing wrong. I have a Nikon dslr. The email address belongs to my grand-dad. So now we are at version 3.5.3 (15/0/2017) but no further reviews since update 2. Please if you are going to start a review follow it through.